Taking to his Instagram account, an elated would-be groom Ankit Tiwari shared the picture with a heart-warming caption. Ankit Tiwari is on cloud nine as the singer is now officially engaged to Pallavi Shukla. The duo, who will be getting married on February 23, 2018, looked made-for-each-other in their engagement picture. The singer, best known for his songs such as Sun Raha Hai Na Tu and Galliyan, took to social media to share a picture of himself and would-be wife Pallavi, whom Ankit’s grandmother had met during a train journey. Yes, the singer is having an absolute interesting arranged marriage. 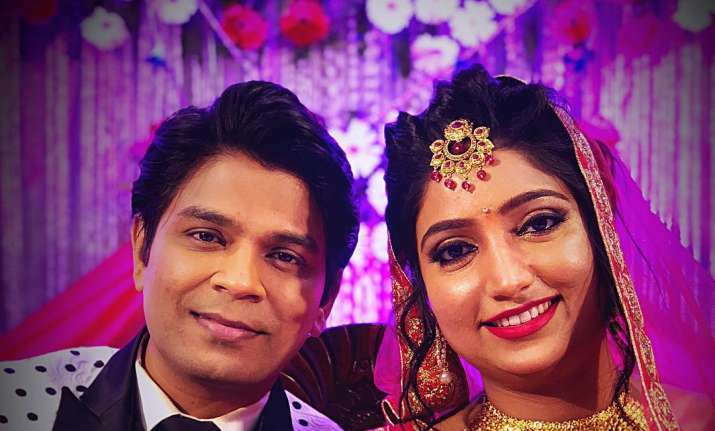 Taking to his Instagram account, an elated would-be groom Ankit Tiwari shared the picture with a heart-warming caption. “I will spend an eternity loving you, caring for you, respect you, showing you every day that I hold you as high as the stars”. Ankit wrote. Ankit’s granny liked Pallavi so much that she immediately decided that she is the perfect match for the singer, according to a report in Mumbai Mirror. Pallavi is a mechanical engineer and is based in Bengaluru. In a conversation with the tabloid, Ankit Tiwari said that once dadi announced that Pallavi would be the family’s daughter-in-law, everyone agreed. “I’m happy that the family is happy and a little nervous too. She is a very sweet and simple girl. During our first meeting there were 10 others seated between us. I’ve introduced herand her family to my work and life in Mumbai where she will live after marriage.” the singer added. On the professional front. Ankit Tiwari provided playback music for the Manoj Bajpayee, Sidharth Malhotra and Rakul Preet Singh starrer film Aiyaary.